A powerful coming-of-age story about grief, guilt, and the risks a Filipino-American teenager takes to uncover the truth about his cousin's murder. Jay Reguero plans to spend the last semester of his senior year playing video games before heading to the University of Michigan in the fall. But when he discovers that his Filipino cousin Jun was murdered as part of President Duterte's war on drugs, and no one in the family wants to talk about what happened, Jay travels to the Philippines to find out the real story. Hoping to uncover more about Jun and the events that led to his death, Jay is forced to reckon with the many sides of his cousin before he can face the whole horrible truth -- and the part he played in it. “The Philippines’ highest court ordered the government on Tuesday to release documents relating to thousands of deaths linked to President Rodrigo Duterte’s drug war. Rights groups quickly welcomed the Supreme Court ruling, saying it would give closure to many families of the more than 20,000 people they estimate have been killed in the crackdown that Mr. Duterte has justified as necessary to end the drug trade. “President Trump suggested that executing drug dealers could help solve the opioid crisis during a White House summit Thursday, an event that the administration billed as a way to measure its progress in combating the nation’s drug problem. “I mirror the disturbing calm of my father, as I always do. We share the space, the silence. But on the inside, I’m a plane with failing engines. ‘He’s gone,’ Dad repeats after some time. ‘That’s it.’ And then a nervous laugh escapes his lips. I try to process the information. Jun is dead--his life has ended. And here I am, sitting in my living room on the other side of the world, a can of Coke on the coffee table, playing a video game on an enormous, wall-mounted flat-screen TV, college on the docket. ‘What do you mean?’ I ask. But he’s already gone, probably retreating upstairs. Left alone, my confusion turns to anger, which starts to grow with nowhere to go like the roots of a plant too small for the pot. I finally drop the controller and bury my face in my hands. I take a few shaky, deep breaths. But my heart continues to race. My jaw stays clenched. My stomach remains knotted. I think of all the letters we wrote each other over the years. What did his last one say? I don’t even remember. Jay was born in the Philippines, to a Filipino dad and an American mom. But he has grown up in America. His Filipino cousin Jun was only three days younger than him. Living halfway around the world from one another, and only seeing one another on rare visits, the two nevertheless developed a deep connection that Jay did not have with the rest of his Filipino relatives. Jun was the sensitive, good-hearted son of a brutal Filipino police chief. His last letter to Jay, near the end of 2015, was written shortly before Jun ran away from home (or was essentially forced to leave by Tito Manning). Jay, who has already been accepted at the University of Michigan for the following fall, has been coasting through his last months of high school. Recalling the special bond that had existed between he and Jun, Jay is horrified to realize that he’d neglectfully let that relationship fall by the wayside. Now Jun is gone forever. Driven by guilt and regret, and without revealing his true intent--to discover what really happened to his cousin--Jay persuades his parents to let him spend spring break traveling to the Philippines to visit his relatives. And, just like that, Jay is soon on a flight to Manilla, for the first time in eight years. He’s on a journey of discovery that will change his life forever. 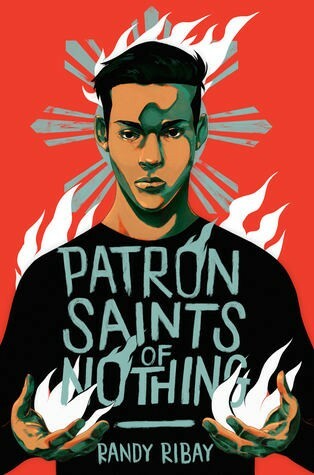 PATRON SAINTS OF NOTHING is a breathtaking tale. It illuminates the horrendous current situation in the Philippines where tens of thousands of drug addicts and small-time dealers have being shot to death by police and vigilantes. As with Jun, every one of those estimated 20,000 who have been murdered was someone’s son or daughter, someone’s brother or sister, or maybe someone’s beloved cousin. Every one of those people killed had good aspects and bad aspects to them, just like you and me. Drug addiction is a big problem, but addicts don’t seek to become addicted or become criminals. We know that, to some degree, addiction is passed genetically. It’s outrageous that Duterte’s murderous drug war has been permitted to go on as long as it has. It’s even more outrageous that the president of the United States thinks that the tens of thousands of murders has been a good thing. I’d already read some newspaper articles about Duterte’s “drug war,” but I didn’t know much at all about the Philippines. In fact, I couldn’t even spell it correctly. PATRON SAINTS OF NOTHING has certainly changed that.